Peterborough Northern Star Under 18s have made a roaring start to their Peterborough Youth League campaign. They followed up their 8-2 win away at Bourne Town Blue on the opening day of the season with a huge 18-0 win at Pinchbeck on Sunday. Hot-shot Harry Catanach led the way on the scoresheet with a magnificent seven goals with Kyial West bagging four and Ryan Ellwood a hat-trick. Completing the rout were Conor Burd (2), Tom Mucklin and Lewis Wells. Star are the early table-toppers in Division One along with Deeping Blue, who also made it two wins out of two by beating Blackstones 5-1 thanks to strikes by Scott Waumsley (2), Reece Driscoll, Edward Robinson and an own goal. Northern Star also top the Under 16 Division One table. Here Northern Star Blue maintained their 100 per cent record with a 5-1 success over Gonerby. Jordan Giddings fired a treble with substitutes Frederico Rocha and Ayman Trabelsi also netting. Not far behind Catanach in the individual goalscoring stakes on Sunday was Liam Sanderson. He smashed six for Yaxley Lynx Under 18s in their 9-1 victory at Spalding Orange in Division Two. Peterborough Sports Under 15s, who were the all-conquering Wasps Under 14 team last season, are the early pacesetters in Division One. 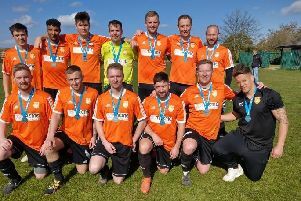 They beat Netherton 11-0 on Sunday and have maximum points after three games. Their goalscorers were Bradley Gilbert (3), Taylor Horne (2), Calum Arden, Connor Bell, Jazleigh Fife, Nasir Nabi, George Warrington and Sean Spalding. Also going well in Under 15 Division One are Whittlesey, who were promoted to the top flight this season. They turned in a superb display of passing football to win 4-1 at Northern Star on Sunday. After falling behind to a penalty, Whittlesey levelled through Eddie Wurr just before half-time. Then in the second half they produced their best team display of the season. A brave run from inside his own half by Luke Toomey ended with him being brought down in the box and Lewis Beckett scored from the spot. Beckett then made it 3-1 with another penalty after Christian Franks’ run through on goal had been halted, and Wurr struck again late on to make it 4-1.